Category: Forecasting climate change effects in 2050 – a microbial perspective! Getting to the root of the problem…. Its been over a week since my last blog, but time is of the essence now, with the end of the field season fast approaching. Over the last couple of weeks we have had some heavy days in the lab, sampling and sorting through the root ingrowth cores from the elevated CO2 x UV-B experiment. 64 cores were extracted in total, originally placed in the plots during May/June 2010. After residing for three years in the soil, roots have started to grow through the specially designed cores and, along with some (hopefully willing!) helpers from Aberystwyth, we had the arduous task of separating these roots from the cores, weighing and sorting soil for analyses. Hopefully some interesting questions will be answered, comparing root biomass from ambient and elevated CO2 treatments, as well as the effects on the chemistry and microbiology of the surrounding soil. However, a day off last Sunday allowed some of us a chance to escape Abisko for a while, with a hike to the summit of Tjåmuhas – approx. 5,700 ft! Even getting caught in a thunderstorm and it being only the 72nd highest mountain in Sweden couldn’t ruin a fantastic day out. The sun is still shining, but it seems like it won’t be long until the nights are drawing in. In the meantime we can enjoy some beautiful sunsets over the lake and a well earned sauna after several tough days in the lab! Things move at their own pace in these parts, especially the weather. But, summer may have arrived at last, with sunshine and blue sky promised this week! I made the most of the fine conditions yesterday and collected soil and gas flux samples from the heath as part of the spatial survey of microbial diversity. After being badly hit by the summer insect outbreak, vegetation is recovering well and looking especially green and healthy across from Abisko village. 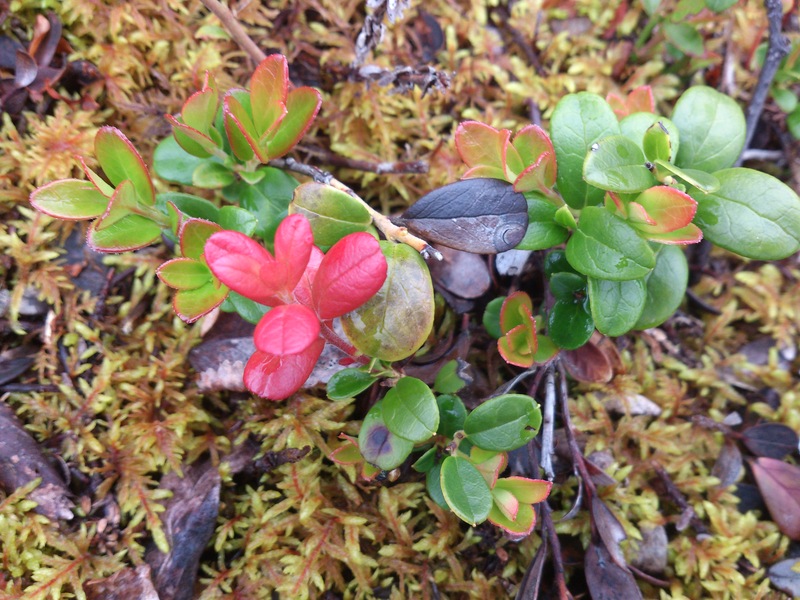 Vaccinium vitis-idaea may have avoided the worst of the Epirrata moth larvae herbivory, but red leaves here indicate fungal damage. The field COSM experiment was completed with obvious treatment effects of Tea + FeSO4 vs Glucose additions on soil respiration. Microbial biomass and phage counts from the cores back in the lab will uncover whether bacterial numbers also increased with this activity, and if the anti-viral properties of the tea extract was sustained after 5 days in the field. Undergraduates from Aberystwyth have been put to work doing vegetation cover + damage estimates on the elevated CO2 plots, as well as assisting us with the gas flux measurements for the NERC-funded project. 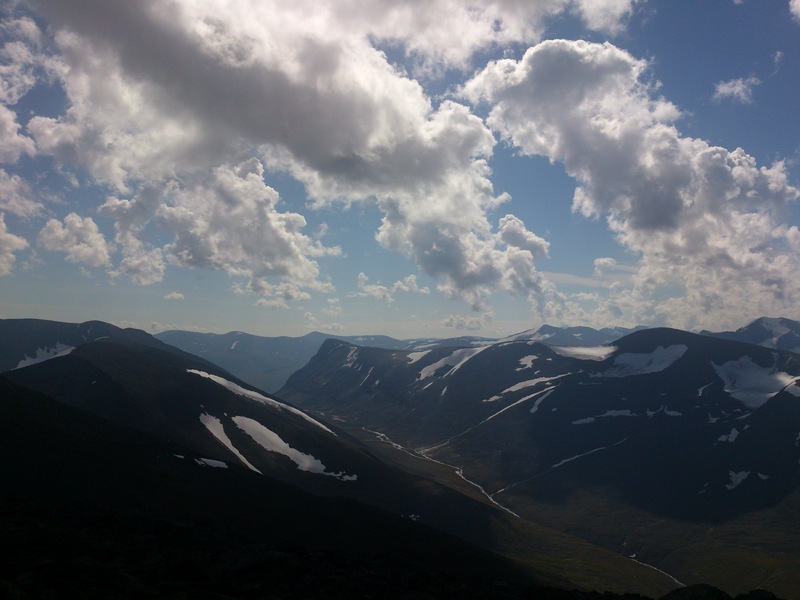 A visit to nearby Stordalen beckons today as we investigate an old eCO2 experiment. 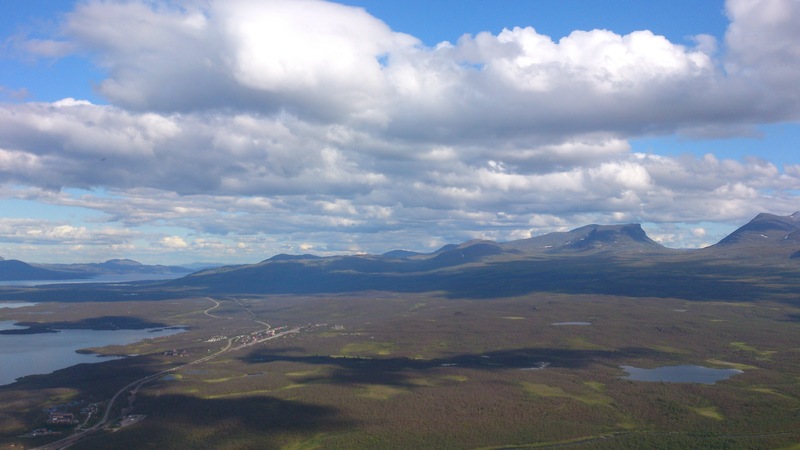 Assessing the “legacy” of elevated CO2 treatments, both above and belowground, could provide new insights into life beyond 2050 in the Arctic, if rising CO2 levels were to be curtailed. However, deciphering ancient maps of the plots may be tricky, let’s hope we don’t have to resort to “dowsing” rods! It has been some time since my last post, as I have been busy in the lab back at Aberystwyth working through and processing the samples collected from May. 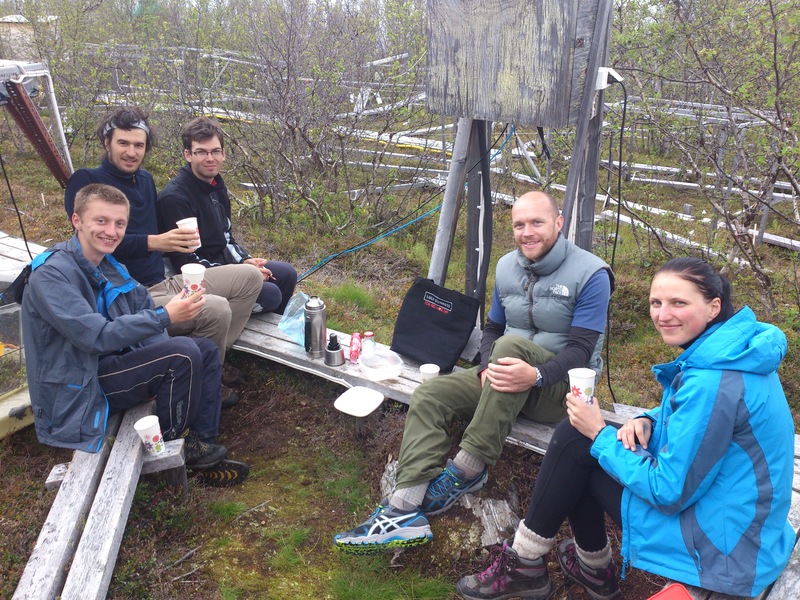 But now a short break is due as I join fellow researchers Dr Dylan Gwynn-Jones and Dr Alan Jones in the field for our summer visit to Abisko Naturvetenskapliga. The station here is busy now, with many people coming and going during the height of the summer growing season. The vegetation is looking green and fresh. Despite another bad outbreak of Epirrata autumnata (Autumn moth) larvae, which destroyed much of the Vaccinnium myrtillus and Empetrum, it is recovering well. I will be repeating sampling of the spatial variation of the microbial community in the heathland, and have spent much of my first week here measuring vegetation cover and damage and soil respiration. Also, I shall be investigating the effects of anti-phage treatments on microbial biomass and activity and carbon substrate addition, to see which may have the greater controlling effect on microbial numbers. 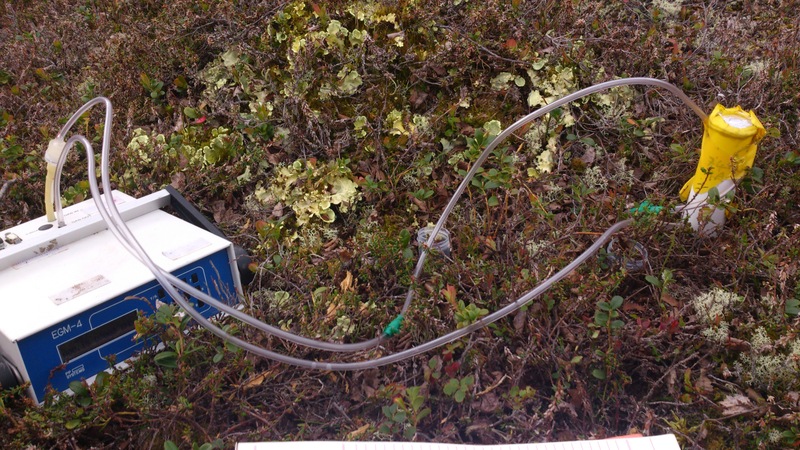 And when weather permits we shall be continuing the gas flux measurements of the elevated CO2 plots. It may not quite be the 30 degree heatwave that some parts of the UK are enjoying, but at least the wind and rain will keep the mosquitoes at bay! It’s been a busy few weeks at the research station and I write this as I am travelling home to sunny Wales after a hard, but thoroughly enjoyable, field season in the Swedish Arctic. After finishing sampling the snow melt experiment I have also been collecting samples across a spatial gradient in the heathland to investigate the relationship between distance and microbial community composition. The environment of the soil is strongly heterogeneous and each gram of soil houses a complex and diverse microbial community. Fine scale local variations in soil properties mean that the microbial community characterised in this single gram of soil could be vastly different to that of one just centimetres away, whereas a single square centimetre of soil a kilometres away could be just as similar. 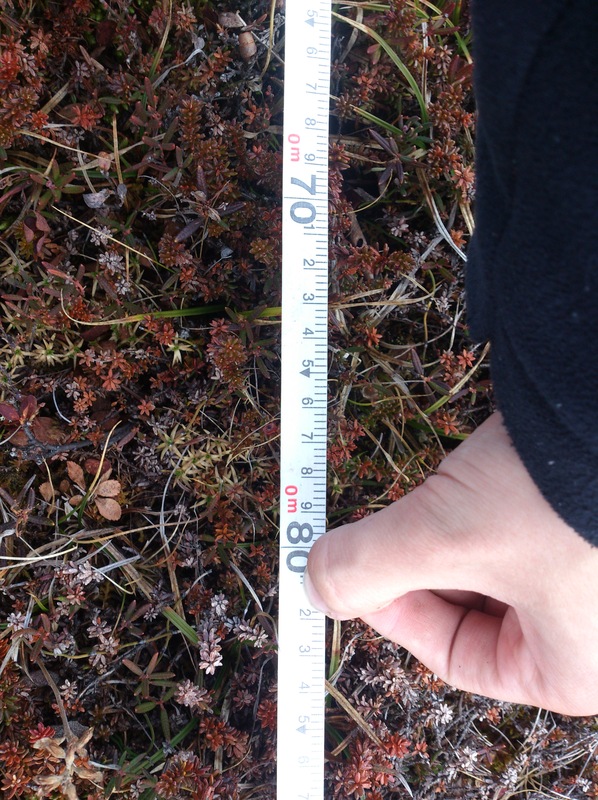 Therefore, any experiment situated on one small portion of the Arctic being representative of a whole heathland ecosystem is an unlikely claim! Understanding the spatial variation of this region will be an important step in trying to characterise the structure and function of the microbial community of the elevated CO2 x UV-B plots. 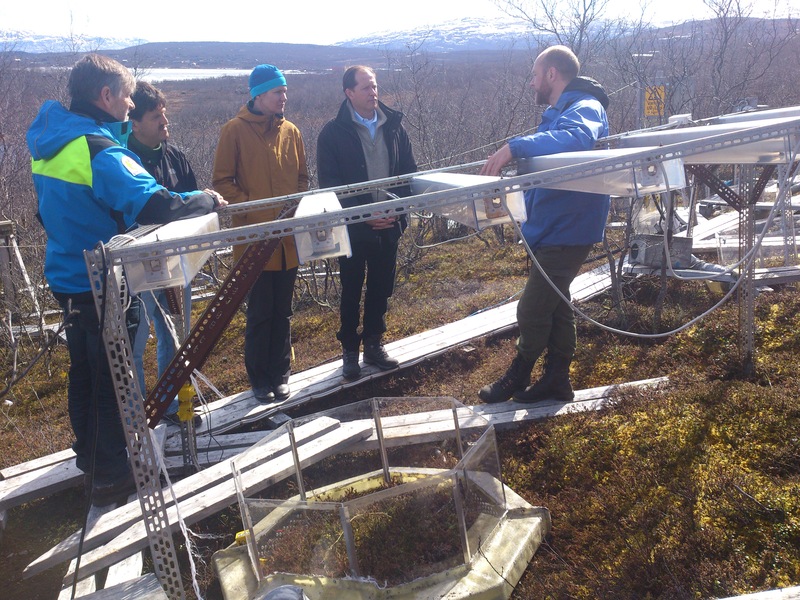 This unique experiment has been running for 20 years at Abisko and this week I have been assisting Alan Jones and Dylan Gwynn-Jones from Aberystwyth getting the site fully operational for the summer. During the summer growing season, the vegetation here will be exposed to approximately three months of elevated CO2 at 600 ppm and enhanced UV-B radiation simulating a 15 % depletion in the ozone layer. Climate change research here has attracted much interest from around the globe as the Arctic remains one of the last unanswered questions in terms of elevated CO2 and carbon cycling. Indeed, following the visit of US Sec. State John Kerry to nearby Kiruna, meeting with the Arctic Council, several US deputy officials and ambassadors were keen to visit the field site at Abisko. Alan and I were very pleased to see the enthusiasm and interest that they showed in the work done by Aberystwyth in the Arctic, but we recognised that our role as scientists goes beyond research and academia, but also being able to communicate our findings effectively with policy makers and the general public. 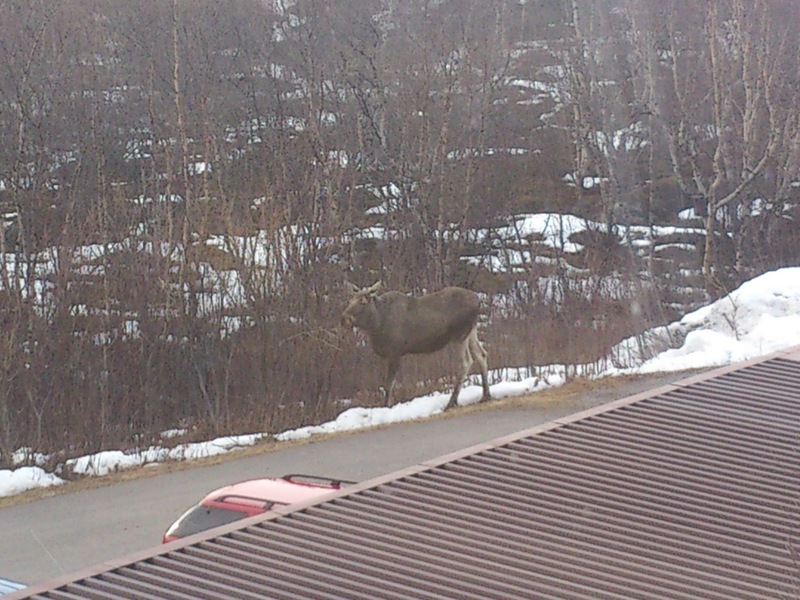 Well it has been just less than a week since I arrived in Abisko and already the signs of spring change are here. The snow is receding and the lake will soon be ice free. So far I have been busy preparing and monitoring my plots, studying the effects of early snow melt on the snow and soil microbial community. The snow cover here is extremely patchy and variable but deeper areas still exist. A sudden warm spell about two weeks prior to my arrival kicked off the snow melt phase, and if climate change is to bring warmer spring temperatures then this may be occurring earlier in times to come. My experiment here involves covering regions with dark, heat absorbent material, making the snow cover melt sooner than in other parts. After a week of snow melt I will collect soil samples over a number of days in order to study the microbial community during this dynamic phase, comparing microbial diversity under different thicknesses of snow cover. I will also investigate some of the interesting questions that arise when studying the complex properties of the snow structure, such as the effects of different snow depths and melt-water on soil properties. It’s not just scientists who visit the research station! The station may be very quiet at this time of year, but there is still lots to do. As well as daily snow depth measurements I have been assisting Dylan Gwynn-Jones of Aberystwyth as we prepare and install the UV-B/CO2 plots in time for the summer growth season. Some repair work will have to be done as we make sure everything is looking in top condition for the visit of the Swedish king in a little under a fortnights time! And after all of this it is nice to be able to kick back with a cold beer and a relaxing sauna by the lake in this stunning landscape! Hello all, Aberystwyth calling! 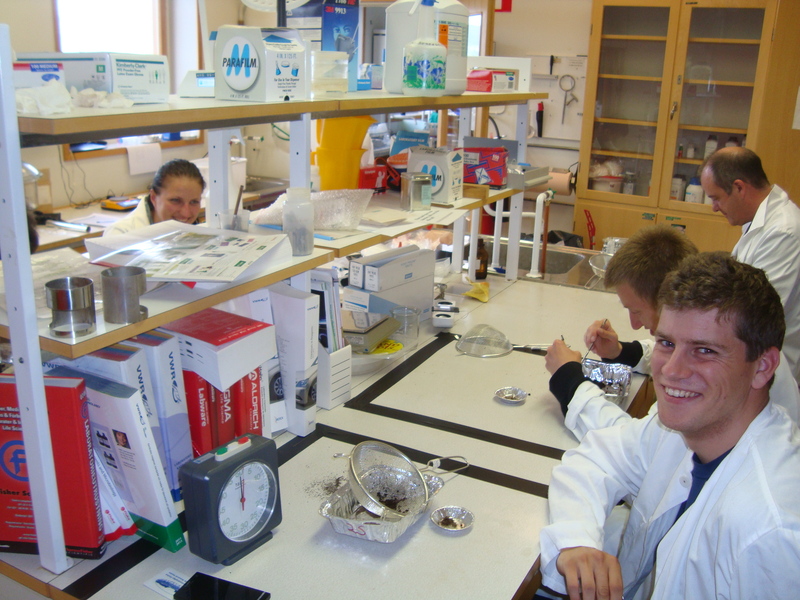 My name is Richard Hill and I am a first year PhD student in Microbiology at Aberystwyth University, Wales. Today I bring you the first, of hopefully many, blogs from at home in Wales and northern Sweden, where I will do my research. 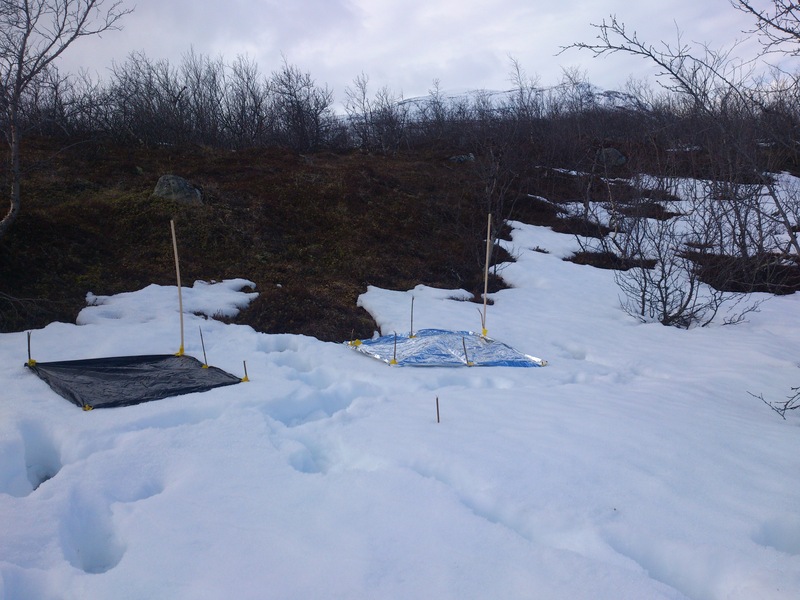 I am interested in the effects of climate change on the structure and function of the soil microbial community in the Arctic, with access to a unique long term elevated CO2 experiment situated in the stunning landscape of the Abisko National Park in Swedish Lapland. 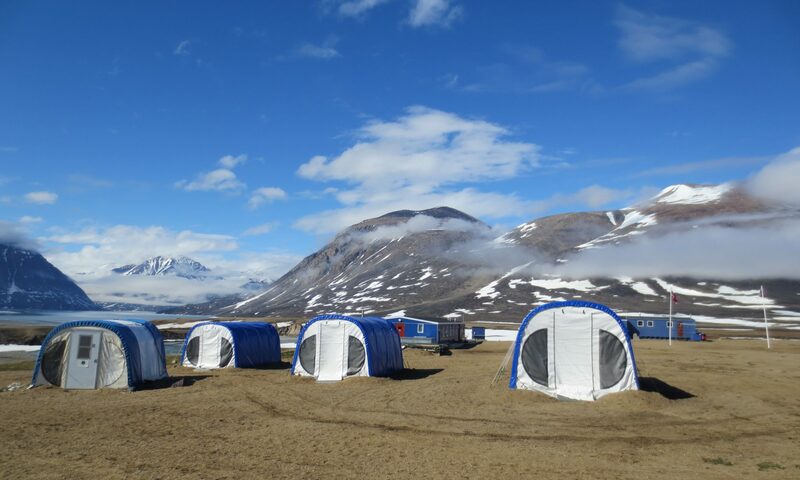 In just over a week from now I shall be departing for my first full field season at ANS. I have been busy preparing for the expedition, where I plan to investigate the dynamic changes that occur in the soil microbial community during the spring thaw. To do this I shall be manipulating the snow pack of the region, accelerating and delaying snow melt to see how this influences the activity of the microbial community below. Along with microorganisms in the soil, I will also be investigating the microbial community and chemistry of the overlying snow cover. All of this has involved some serious science in the lab – as you can see! 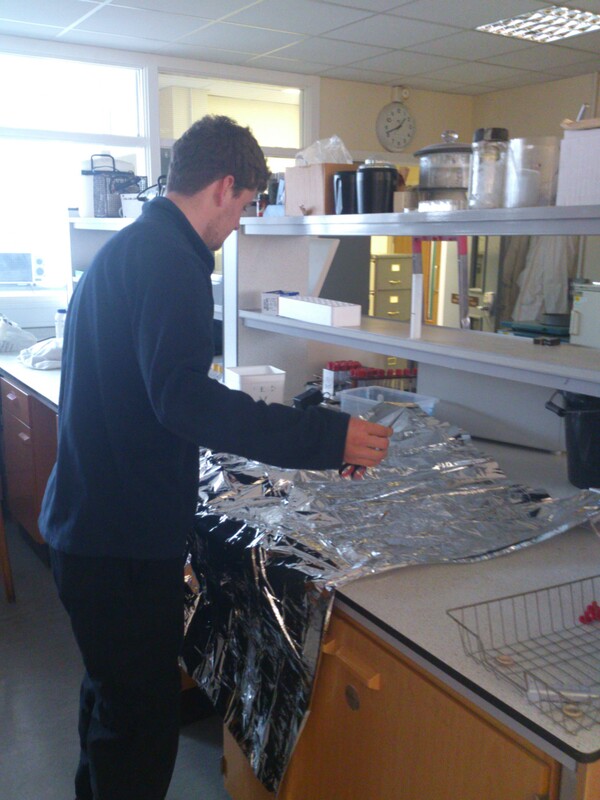 – preparing dark, heat absorbent material and reflective “space blankets” to place over the snow manipulation plots. In fact, I have even managed to get out and do some fieldwork in the wintry conditions away from the Arctic – the recent cold spring we have had here in the UK saw substantial snowfall across much of the country, and provided the perfect excuse for me to get out of the office! 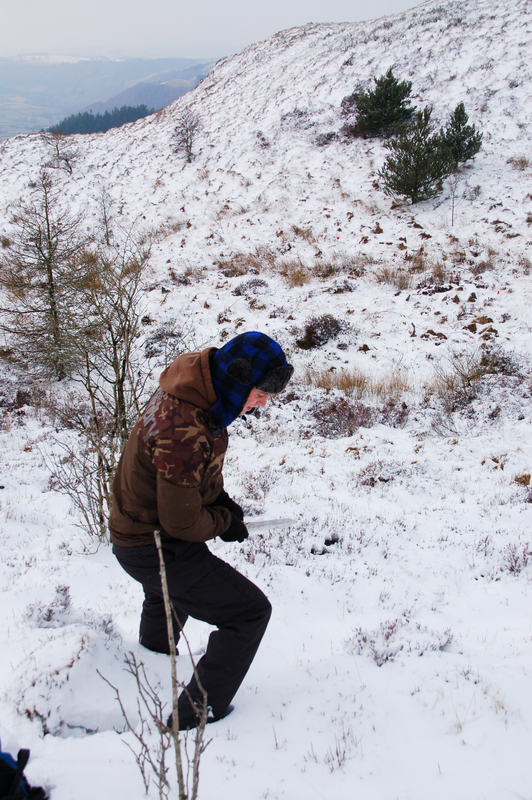 Sampling snow from Nant-yr-Arian heath – the closest Aberystwyth will get to Swedish Lapland! I will be bringing regular updates from my field visits to Abisko and beyond and look forward to sharing news of my exploits!